The fourth largest amateur telescope in North Carolina and it is right here in Maiden! This instrument is equiped with digital setting circles and four finder systems. It stands over 11 feet tall when observing the zenith, but it is easily transported to remote sites. 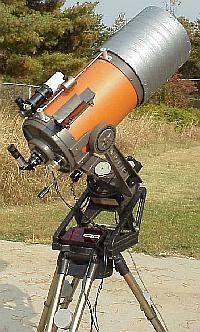 We call this scope "Hermann's Monster"
Our main telescope for lunar and planetary video work as well as visual use. This instrument has a computer aided telescope system for locating thousands of objects in the sky. This instrument can be guided by students from inside the classroom or from the Bob Hunt Amphitheater. Lunar images from an attached video camera can be sent to the screen in the amphitheater or to the high resolution monitor inside the classroom. 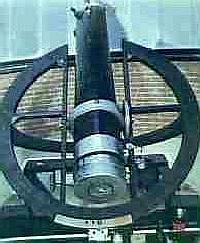 This is the telescope for which the Lucile Miller Observatory was constructed. 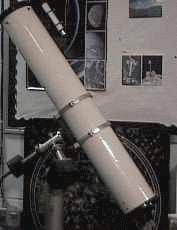 Completely hand made by O. N. Rich in the 1950's - including the hand - ground the mirror - this telescope has a long focus which allows for exceptional views of the moon and planets. The unique split ring horseshoe mounting allows accurate tracking stars and ease of movement. This is our favorite 'light bucket" and it is pressed into service at almost every observing event. It is very portable and easy for just about everyone to use. 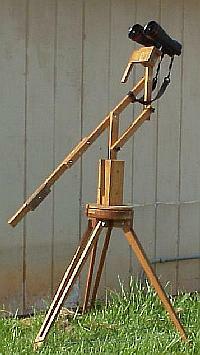 It has one of the earliest Dobsonian mounts constructed yet it has a smooth movement. The optics have been fine tuned by Bob Hunt to make this instrument one of our best. Another of our workhorse instruments. 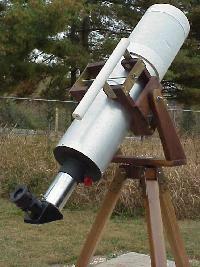 This telescope is used to view just about any object in the sky. 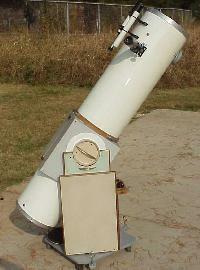 It also is used extensivly for solar viewing with white light or hydrogen-alpha filters. This telescope features exceptional optics, a precision drive, and many accessories for accurate photographic work. 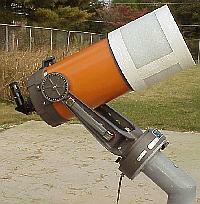 The portability of this scope makes it a favorite when we travel to schools for star parties. This classic design is often the first choice for beginning astronomers. Because of the smaller size, it is a favorite with children as well as adults. It can easily tracks sky objects and users are encouraged to "just scan around" with it. 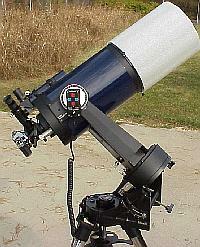 This small, high quality refractor gives superb wide field views of large objects such as clusters, nebulae, and galaxies. The traditional design and ease of use makes it a favorite with our visitors. Don't let this little scope fool you! This is no department store toy. 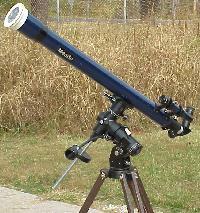 It is light weight and uses quality 1.25 inch eyepieces for great views of the moon, sun, and planets. 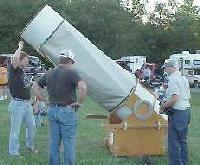 We use this telescope as a teaching tool to show the public what a quality small telescope can do. These monster binoculars are too heavy to hold by hand. The cantilever system allows the binoculars to be aimed at a specific object and easily moved up or down to accomodate the height of any observer, from the kindergarten to to the basketball team! The 3.5 degree field of view is great for star fields, open clusters, and the moon. Good binoculars are just as valuable in astronomy as a telescope. Many people get their first look at the sky through binoculars. 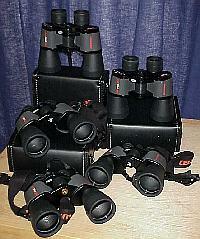 Items such as nebulae, clusters and the moon show up well in wide field instruments such as binoculars.